We are excited to be offering a free workshop on October 2, 2015 at 7pm to people in the Baltimore area on suicide prevention to help you learn how to respond when someone you know expresses a desire to die. We had an opportunity to interact with Deepak Reju who will be our speaker/teacher for the evening. Deepak is a very experienced counselor and has interacted in caring for people struggling with depression and suicide. He will lay out a practical approach to how to be better equipped to care for people and how faith makes a difference in that care. Below is a brief interview between Life Counseling Center (LCC) and Deepak to help give you a picture of why this topic is so important. LCC: Why do a workshop on suicide? Deepak: Because the hardest thing you will ever face in counseling (in my estimation) is someone trying to kill himself. Counseling with a suicidal person is filled with life or death moments. Picture this: You are on the phone with a person and they tell you they are alone and have a gun and are considering turning it on themselves. Or a woman calls you in panic after she’s swallowed 100 pills. Or a man threatens to jump off of bridge because life is not worth it anymore. Or it can be a cat-and-mouse game, when the person tells you just enough to get you scared for her life, but then she refuses to go to the hospital. You feel helpless. Not knowing what to do in any of these situations could literally mean someone loses his life. LCC: Who is this workshop best suited for? Deepak: Anyone who wants to learn. Not just professionals, but family members, friends, co-workers and plenty of others. LCC: How well is the church doing in addressing this topic? Deepak: The church is doing okay. Some churches are ready and willing to love, support, care, and engage someone who is struggling with suicide. But many are at a loss with what to do, which is why we need to train, equip, and pray together. This workshop will do just that. LCC: What do Christians often misunderstand about people who are suicidal? Deepak: They believe that someone who is doing this poorly—willing to kill herself—can only be helped by a professional. The normal, everyday Christians think they need not bother because they don’t know what to do or they doing have any the professional training. LCC: Is everyone who expresses a desire to die at risk? Deepak: No. Come to the workshop, and I’ll explain how to assess when someone is low risk or high risk. LCC: If people are depressed does this mean they will likely commit suicide? Deepak: There is a close connection between depression and suicide. If you are depressed, you are more vulnerable to suicide, but just because you are depressed doesn’t mean you are suicidal. LCC: What do you enjoy most about being a part of personal ministry and biblical counseling? 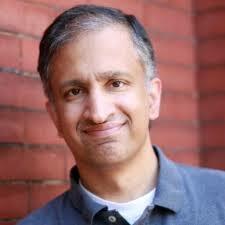 Deepak: In regards to personal ministry, I love helping people. I’m a pastor at heart. Pastors should be dirty, smelly shepherds because they spend their time with the sheep. In regards to biblical counseling, I love mining the deep well of Scripture to see how God’s take on everything really makes a difference. Everyone is welcome to this event. While the workshop is free we kindly ask that you pre-register to help with preparation. We look forward to learning and interacting with this incredibly important topic. It is our hope that many are helped as we seek to better understand and care for people. Please consider joining us. For more information please visit our website or call (443) 419-3884. Deepak Reju (MDiv, PhD) is the pastor of biblical counseling and families at Capitol Hill Baptist Church in Washington, DC. He is the author of several books and articles. He is also the president of the board of directors of the Biblical Counseling Coalition and a trustee of the Christian Counseling and Education Foundation.